Always ready for a cookie to have and share. 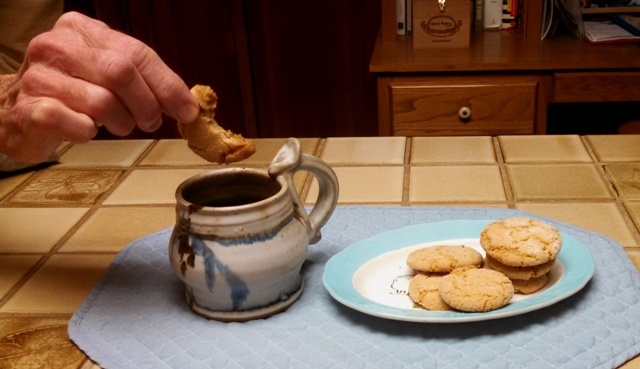 Sesame Cookies were a surprising good crisp and crunchy cookie, great for dunking in coffee, cocoa and tea. They are perfect for dipping because the cookie absorbs the liquid, softens and holds together to be eaten without falling into your cup. This is not my recipe, it is from Cooking Light’s Quick Baking Special. I had not tried them until I realized I had some tahini left over from making hummus and also some roasted sesame oil. When cooking I want to use all ingredients completely and not discard the littlest left over. Sesame Cookies did not sound appealing – no chocolate – though looked very tasty. And they were very tasty! Soon called for another batch of cookies. 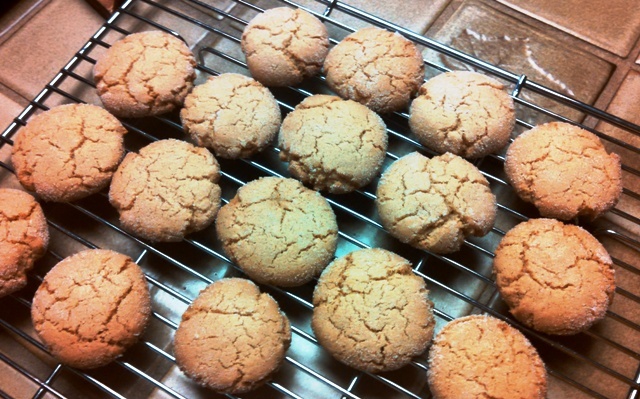 Sesame Cookies, cookies with roasted sesame seed paste and oil. 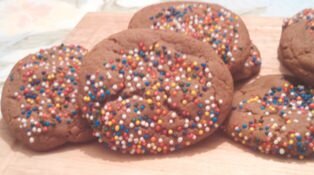 A crisp and crunchy cookies with a great nutty flavor great to dip into your coffee or cocoa for a snack or break time. Combine flour, cornstarch, baking powder, soda and salt, blend with a whisk. Place brown sugar, tahini and oil in a large bowl. Bead with mixer at medium speed until well blended. Add syrup, vanilla extract and egg; beat well. Gradually add flour mixture to the sugar mixture, beating at low speed just until combined. Lightly coat hands with cooking spray. Shape dough into 36 balls (about 1 inch each). Place granulated sugar in a shallow bowl. Roll dough balls in granulated sugar. 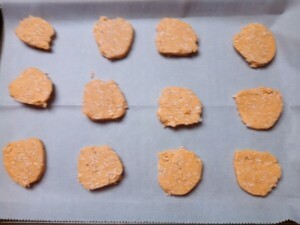 Place 2 inches apart on baking sheets lined with parchment paper. Flatted balls with bottom of aa glass. Bake 375 F for 10 minutes or until lightly browned. Cool on pans 2 minutes; remove cookies to a wire rack to cool completely. Recipe taken from Cooking Light: Quick Baking Special pp 52-53. 2010. While I followed the recipe exactly, or meant to, I inadvertently added 2 tablespoons of vanilla instead of 2 teaspoons. Interruptions can be a disaster, however I was not going to stop at that; so with 2 tablespoons of vanilla, I finished and baked the cookies. They were such tasty, nutty flavored cookies, almost like a hint of peanut butter. As quoted from Cooking Light, “A touch of corn syrup and cornstarch ensures crispness.” The tahini gives the Sesame Cookies a subtle nutty flavor. This entry was posted in Desserts and tagged Cookies, crunchy cookie, dipping cookie, sesame oil, sesame paste, snacks on March 28, 2016 by Julia Ann. The Oatmeal Coconut Crispies are good cookies to freeze for later. Baked cookies can be stored frozen for 9-12 months. 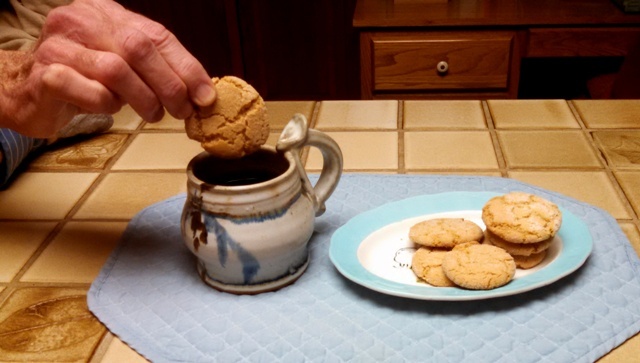 Having baked cookies on hand in the freezer is handy to have available whenever there is a request to furnish cookies for a special event, tea, drop-in visitors or spoil your co-workers. I have never kept a bag of cookies that long! The Valentine Sweet Sugar Cookies and the Shamrock Cookies were rolled cookies. After mixing the dough, it was refrigerated for a few hours, then rolled at room temperature and cut out with cookie cutter, baked and iced. Using a cookie cutter makes the same size and shape, depending how thick they are cut will vary the texture from soft to crisp. They are baked until lightly browned and have a rich delicate flavor. 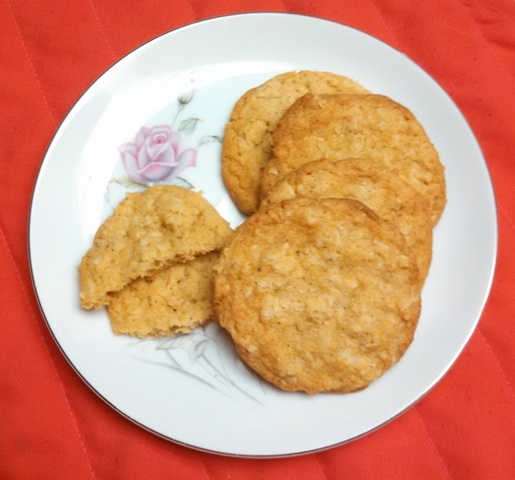 A refrigerator crispy cookie with favorite flavors of oatmeal and coconut, a good cookie to serve and freeze for later. Into large mixing bowl, cream butter, shortening and sugars. Add the eggs and vanilla, cream until fluffy. Into smaller bowl, measure the flour by dipping method. Add the soda and salt, whisk to blend. Stir into the shortening mixture. Blend in the oats and coconut. The dough will be soft. 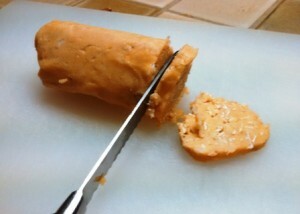 Form the dough into logs with a 2 inch diameter. 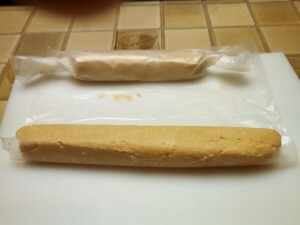 Wrap in wax paper, refrigerate overnight. Heat over to 400 F.
Line baking sheets with parchment paper or light grease pans. Cut the log into ¼ inch slices. 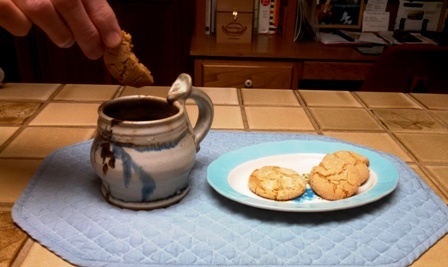 The cookies do spread, allow 2 inches between cookies. This is adapted from Betty Crocker's Cooky Book, 1963. Cookies are such a handy snack. The only trouble is it can be too handy to nibble on all day. “I just ate one …… at a time.” Haven’t you heard that from your children, or yet, your own thoughts. 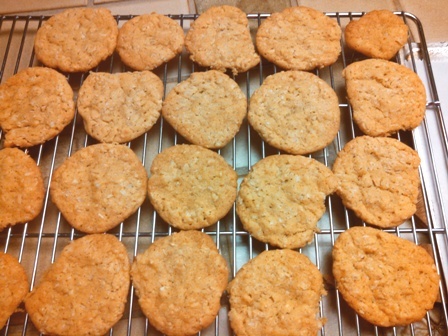 This entry was posted in Desserts, How-To and tagged coconut, Cookies, desserts, oatmeal, refrigerator cookies, snacks on February 23, 2016 by Julia Ann. When cooking and baking I use olive oil and butter interchangeably or together in many recipes. 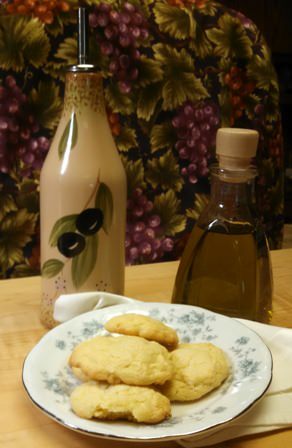 I had not thought about the difference until I wanted to make some cookies and had only extra virgin olive oil. A little research, The Olive Press recommended using olive oil in all baking goodies. 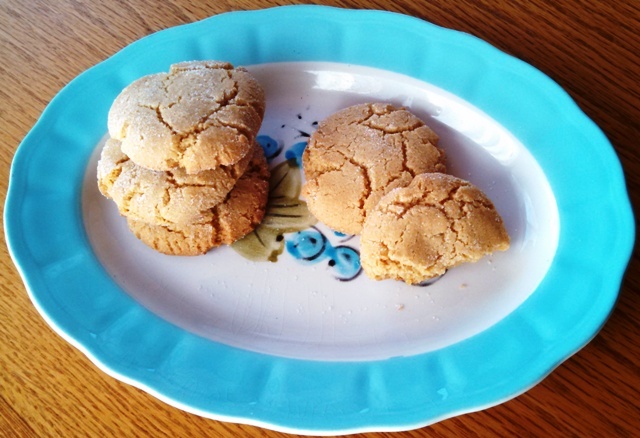 Using a recipe from The Fannie Farmer Cookbook, I adapted an old-fashioned sugar cookie to an Olive Oil Coconut Sugar Cookie. I have not made it with butter, so do not have a good reference to compare. It was a firm cookie, not soft or crisp. The other objective, I wanted to show the conversion chart for butter to olive oil. There are many benefits in using Olive Oil. Olive oil is a monounsaturated fat which comes from a plant, the Olea europaea. the olive tree grown primarily in the Mediterranean countries such as Italy, Greece, and Spain. Monounsaturated fatty acids are said to be a healthy dietary fat, along with peanuts, cashews and avocados. These fats help to reduce the LDL cholesterol or the “bad cholesterol”. When thinking of olive oil, cooking usually comes to mind first. Cosmetics, medicine, soaps and even fuel for lamps all may be made from olive oil. However, when discussing benefits it is related to our health. There have been multiple studies made to assess benefits of olive oil. 1. Protection of the cardiovascular system. 3. Lowering the risk of depression. 4. Reduction of breast cancer risk. 5. Maintaining healthy cholesterol levels. 6. Extra virgin olive oil may protect against Alzheimer’s disease. 7. Prevent acute pancreatitis by using extra virgin olive oil. 8. Protect the liver with the use of extra virgin olive oil. 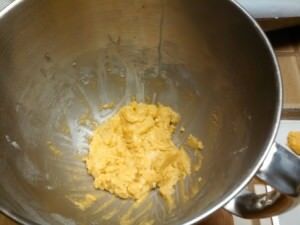 Coconut cookie batter made with extra virgin olive oil. This recipe made about 36 cookies. I like to roll the teaspoons of dough into a ball, then flatten with a bottom of a glass dipped into sugar. It gives a prettier and sweeten top to the cookie. 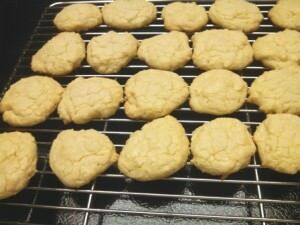 Out of the oven, Olive Oil Coconut Sugar Cookies. 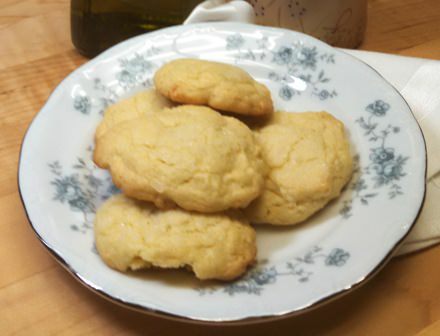 A new take on an old fashioned sugar cookies, using olive oil instead of butter. Adapted from The Fannie Farmer Cookbook. Measure and mix together: flour, salt, baking powder and coconut; set aside. In a large mixing bowl, cream the olive oil and sugar, beat until light and blended. Add the egg, vanilla and coconut flavoring, beat thoroughly. Add the dry ingredients to the oil and sugar mixture, adding ½ cup at a time. 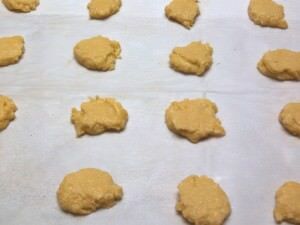 Roll teaspoons of batter into a ball and place on cookie sheet 1 inches apart. Flatten with bottom of glass dipped in granulated sugar. Bake 8-10 minutes until lightly browned. Julia Ann and cookbookinabox® in partnership with Netta Belle’s Choice® brings you great recipes for your cooking experience. ©2007-2018 Netta Belle’s Choice® The Art of Gourmet Cookery® cookbookinabox® “Reg. U.S. Pat. & Trdmk. Off.” Reg. “Trade-marks Canadian Intellectual Property Office. “ Netta Belle’s Choice® The Art of Gourmet Cookery® cookbookinabox® All rights reserved. This entry was posted in Desserts and tagged coconut, Cookies, dessert, olive oil, snack, Sugar Cookies on February 9, 2015 by Julia Ann. Loaded Oatmeal Cookies for an after school snack. These will soon become your favorite cookie. You don’t have to be a child to like these Loaded Oatmeal Cookies. We had some relatives with us for a week. Well, in midweek, I had to take time out to back another batch. Just too easy to take one on the go. How can you turn a cookie with molasses, whole wheat flour, wheat germ, old fashion rolled oats and raisins as a bad cookie for you? You forget there is shortening, pecans, chocolate chips and coconut flavoring. 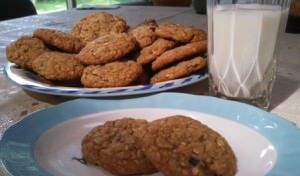 Loaded Oatmeal Cookies are for an after school snack for your children, or coffee break at work with your co-workers. They provide extra nutritive value in using molasses, whole wheat flour, wheat gern, old fashioned rolled oats and raisins. Preheat oven to 350 F or 375 F depending upon your oven's heat. In mixing bowl, cream together shortening and sugars. Add eggs, molasses and coconut flavoring to sugar/shortening mixture and thoroughly blend. In separate bowl, measure and sift together, flours, wheat germ, soda, salt, cinnamon and nutmeg. Using a whisk, blend the dry ingredients. Gradually add dry ingredients to mixing bowl of wet ingredients, beating after each addition. Add the rolled oats, raisins, pecans and chocolate chips. Beat at a low speed to thoroughly mix together. 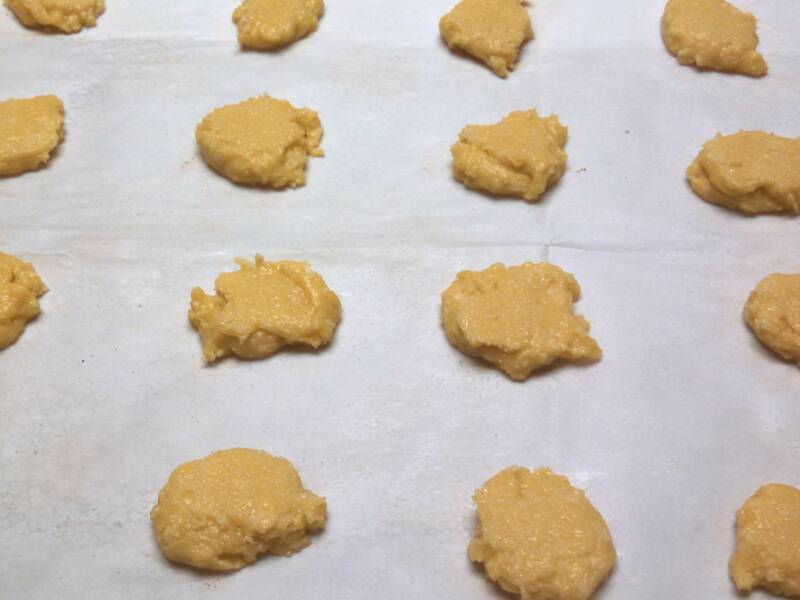 Form inch balls of cookie dough put on cookie sheet 2 inches apart. Flatten balls with a flat bottom glass dipped in sugar. Bake 350 F 8-10 minutes. Cookies are nice to have available when unexpected guests stop by. You do have to remember not to eat them all at once. Cookies are easy to freeze in freeze bags, just don’t tell the family they are in there. Have you ever planned to make chocolate chip cookies only to discover the chocolate chips had already been eaten. That is when you need plan B. 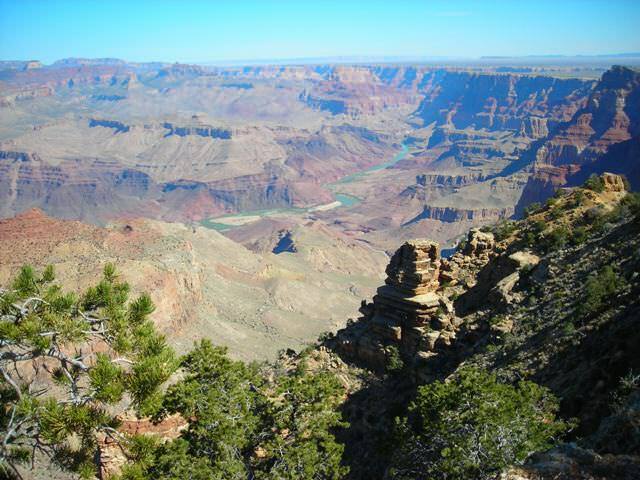 Try the Grand Canyon Hermit Cookies. Yes, they have molasses in them too. No one has eaten my molasses before I used it! For a change of taste, here are rolled sugar cookies. Takes a little more time or roll out and add icing. 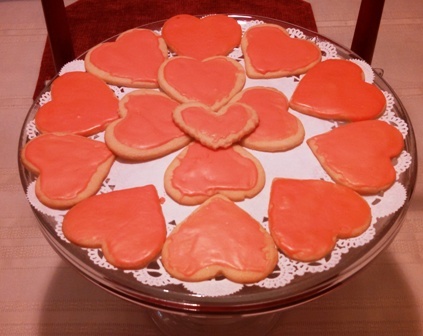 They can be make into hearts, candy canes, or cut into circles for pumpkins with butter cream tinted icing. 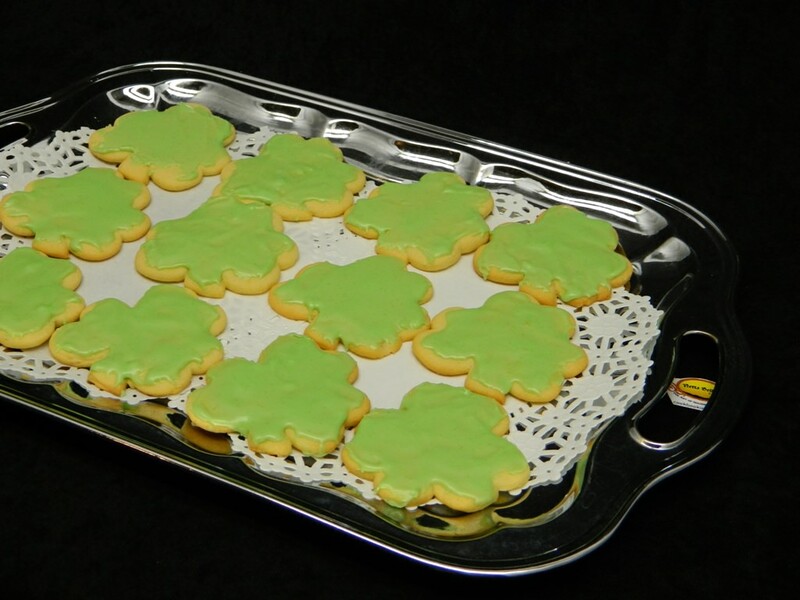 These make pretty cookies for special occasions. An easy recipe. cookbookinabox® in partnership with Netta Belle’s Choice® Spices, bring&nbsp you great recipes, outstanding herbs and spices for your cooking experience.©2007-2018 Netta Belle’s Choice®cookbookinabox® “Reg. U.S. Pat. & Trdmk.Off.” Reg. “Trade-marks Canadian Intellectual Property Office.” nettabelleschoice.com and cookbookinabox.com. All rights reserved. 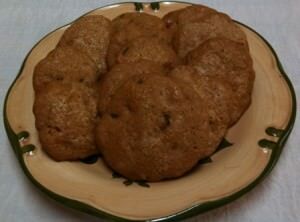 This entry was posted in Desserts and tagged chocolate chips, Cookies, molasses, old fashioned rolled oats, wheat germ, whole wheat flour on August 3, 2014 by Julia Ann.